Walk Wellington is the perfect name for the city tour we took to kick-start our mini adventure in New Zealand’s capital. We went open minded, expecting to learn a bit about the history and architecture. Our expectations were far exceeded as we discovered a city filled with mystery and surprise around every corner. It’s in the detail, the little stories, plaques, hidden secrets that I never knew existed. Our guide Sheena gave us just enough information to hold our interest but never seemed to drag a story longer than necessary. We joined the Essential Wellington Walks daily morning tour. 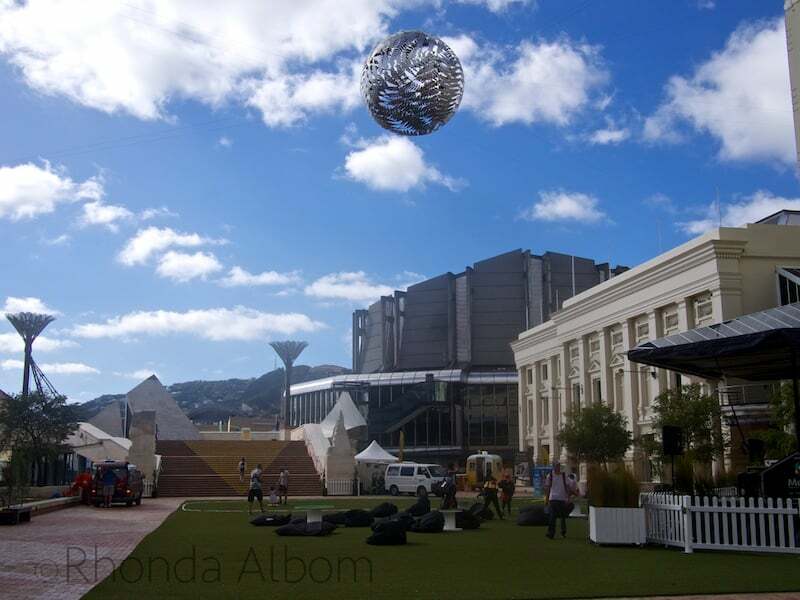 It took us to familiar places like Civic Square, the Wellington waterfront, Queen’s Wharf, Lambton Quay, and Parliament. Plus lots of new places for me like the Old Bank Arcade, Supreme Court, and Old St. Paul’s Cathedral. Our first stop was the Civic Square. The “green” is a new addition as Wellington is one of the current host cities for the Cricket World Cup 2015. We saw these green patches springing up throughout the city. Prior to the big 1855 earthquake, the land we are standing on was underwater. The quake caused a 1.5-metre uplift (plus there is some reclaimed land). This sculpture represents the proportional size of New Zealand’s three main islands: North Island (on the left), South Island (on the right), Stewart Island (the tiny black area on top of right side) and Cook Straight (space between North and South Island figures. Our guide pointed out interesting artwork and sculptures throughout the walk. 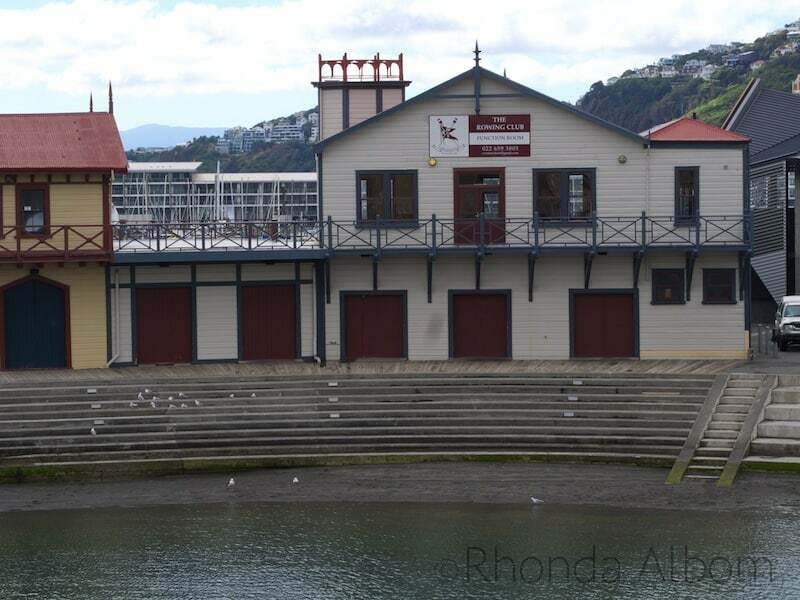 This boat shed is one of Wellington’s oldest buildings. The tower was built in 1885 to protect the country from invasion by Russia. The old Public Trust building. Down this escalator in the old bank building, under glass panels on the floor, you can see Plimmers Ark, a triple-masted sailing ship which had come ashore during the big earthquake of 1855 and had been forgotten until it was discovered during retrofitting in 1997-99. 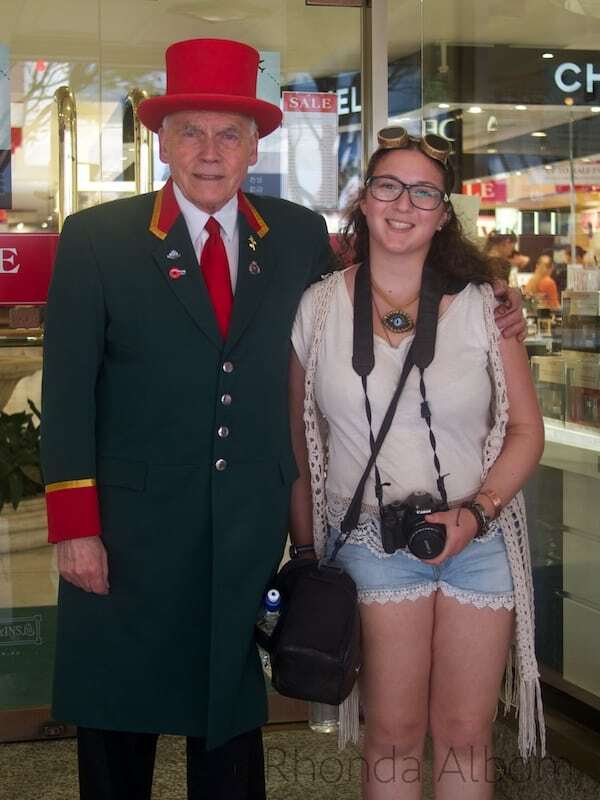 One of two department stores in Wellington, Kirkcaldie and Stains has a doorman reminiscent of Harrods in London. Of course, we had to return when Sarah discovered that the original costume worn by Bilbo Baggins‘ in Lord of the Rings was on display inside. 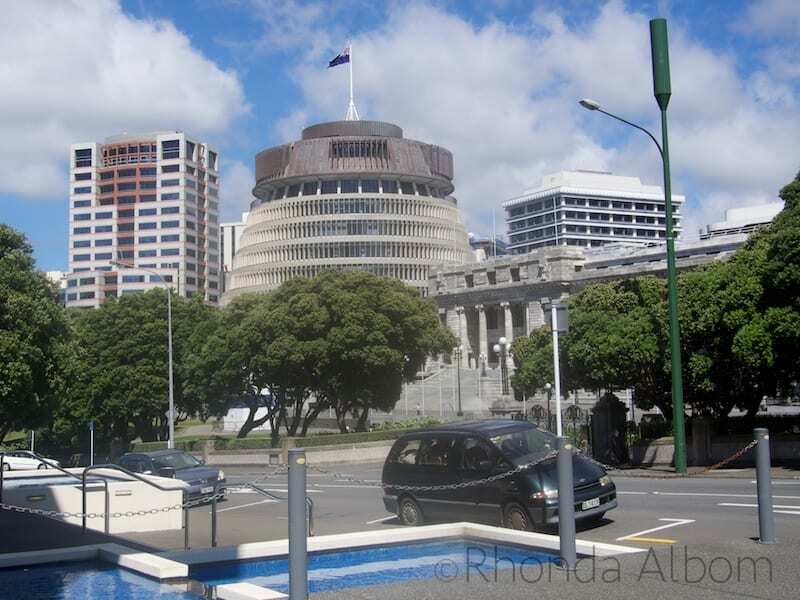 Parliament and the building nicknamed the “Beehive” in New Zealand’s Capital City. Notice anything unusual about this “walk” sign? It’s a woman! 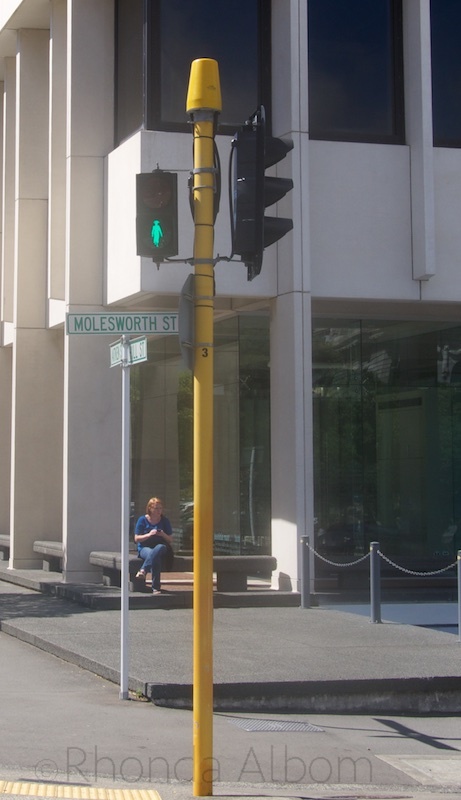 Unlike the other lights in New Zealand, the lights near Parliament have a green outline of Kate Shepard celebrating the fact that New Zealand was the first country in the world to give women the vote. The totem pole like Māori statues are called Pou and represent the upturned Waka (Māori canoe). As the tour group walks between these two, Sarah turns to see where I am. The final stop was Old St. Paul’s Cathedral. I was so surprised to see such a beautiful, handcrafted cathedral in New Zealand. 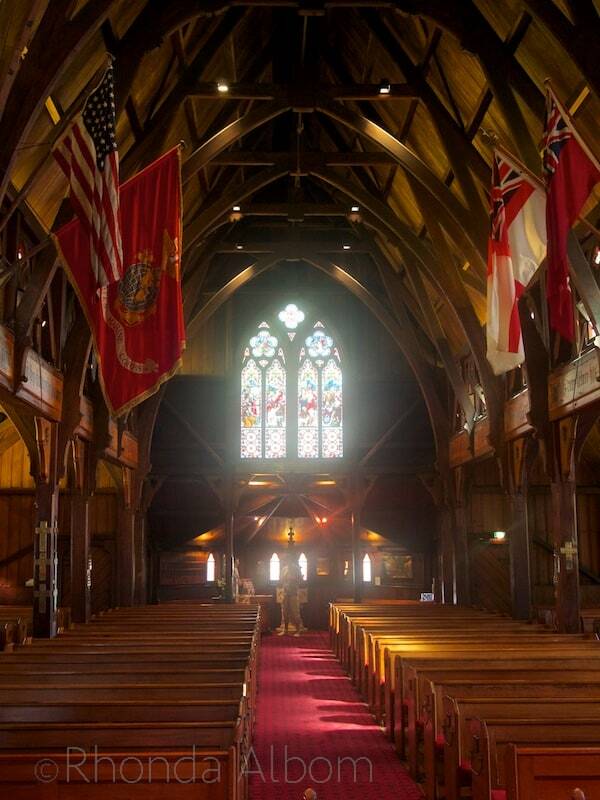 The old American flag (48 stars) hangs here as the church was also used by the 33,000 American Marines who arrived in New Zealand in May 1942. 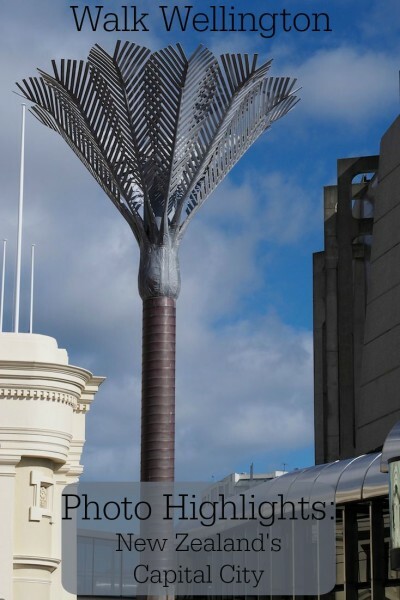 On each of my prior visits, I have walked the same Wellington streets, camera in hand, and missed the details that made our Walk Wellington tour so fascinating. I have only touched on it here. I will admit, I am a person who enjoys city walking tours, and this one really shines in my book. The Walk Wellington tour got our adventure off to a good start. I recommend taking it early in your visit to the city like we did. I think it’s a good value for the money. 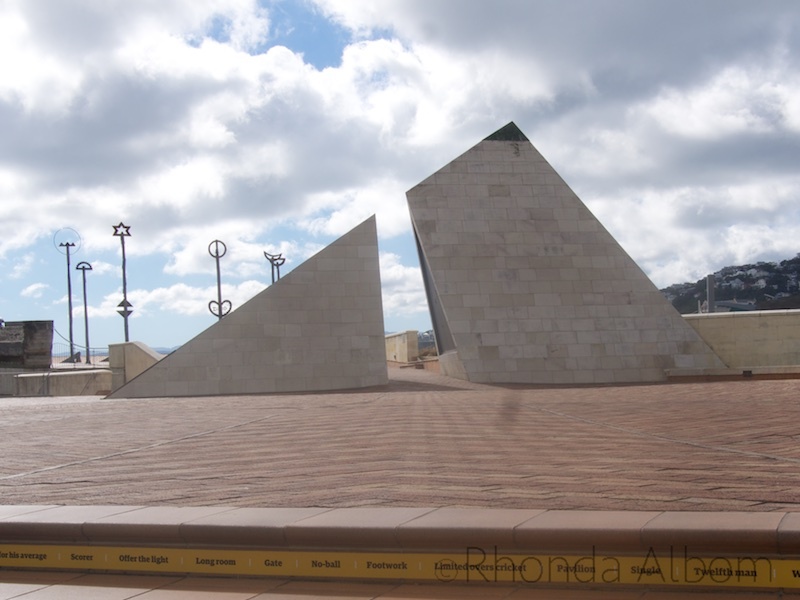 Walk Wellington tours start from the i-SITE Visitor Centre in Civic Square every day at 10 am. They do not require a reservation. For more city highlights check out: Wellington Activities: 37 Things to do in the Capital of New Zealand. 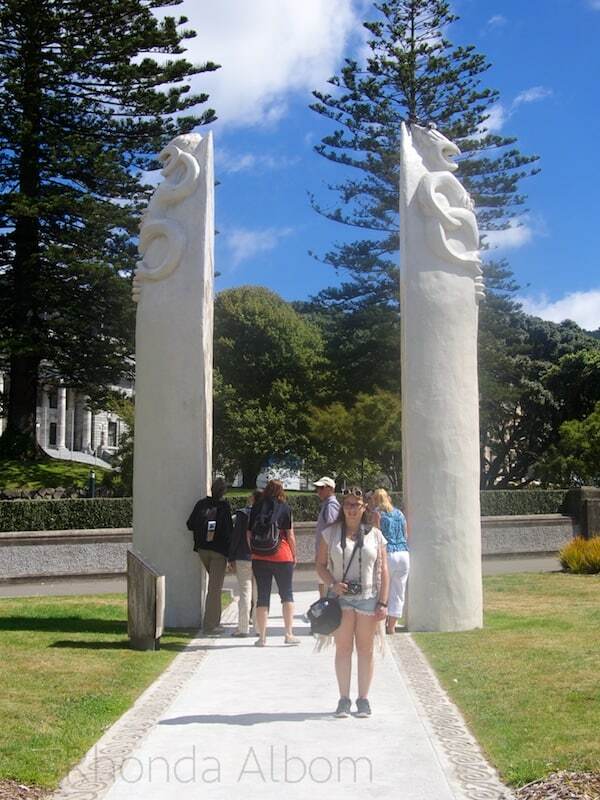 Will you join the Walk Wellington tour on your next visit to New Zealand’s capital city? Disclaimer: I was provided with a complimentary tour, however, the opinions expressed here are strictly my own. Yes, this place is really wonderful, beautiful architecture! Great photos !! This is a million dollar sentence that you just wrote: “you will find success online in the internet network marketing world the moment you start thinking about how you can serve yoru fellow man rather than thinking about how you can profit from him”. Pretty! I love the church. What is that orb in the sky in the first shot? I doubt if I’ll ever make it to New Zealand, but I think that the best way to see any city or small town is on foot. I see things in my own city and in the countryside that would never be seen except on foot. It looks like you had a wonderful time in Wellington. I’m sure it was great to walk around there. It looks like it was a nice day to. I love that sculpture! I also like Cricket World Cup 2015. It’s looks like it’s hanging from the sky. I need to clarify, the hanging ball is art that has always been there. The “green” on the ground, that is what was special for World Cup. Oh wow Rhonda, now I want to hop on a plane and go there for another visit. I haven’t been in years … pre-kids actually. Wonderful post and pics! I did not know that about the traffic lights (female pic) and think it is awesome! Being in the center of our little country, Wellington can’t be too far. Go for it. I got really cheap flights on Jetstar. How beautiful is that church! And a flag with 48 stars! So neat. Would I go on that tour? Sure, if I could ever get there! I would love to visit New Zealand. On my bucket list. I know. I was so surprised. I thought we had to travel to Europe to see such beautiful stained glass. And it’s rare to see the flag still with 48 stars. Thanks for clarifying for my American readers – this flag was before Hawaii and Alaska joined the union. I’m intrigued by the floating metal ball in the first photo! I love walking tours 🙂 Excellent! Cool shots from your walk. Thanks for taking me along. Glad you enjoyed the tour. If you ever get here, there is tons more interesting information in the tour, I just gave you a taste. 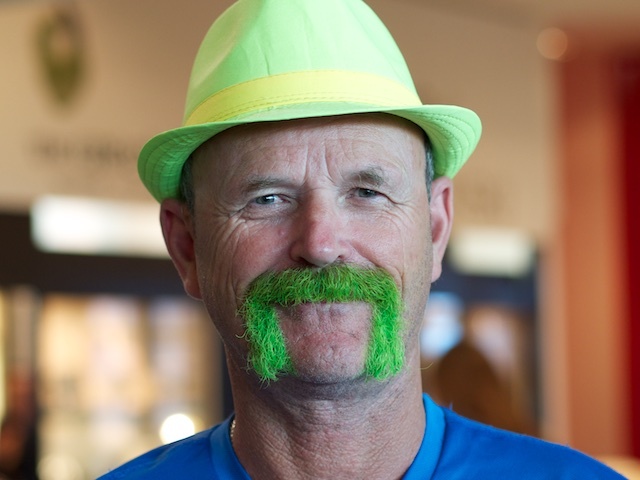 Hi Rhonda .. fascinating to see – the less I say about the cricket the better … hope you win though!! LOL – the cricket comment was actually targeted at a few of my Aussie readers, but I guess you wouldn’t be too thrilled about the outcome either. I thought that ship was really interesting too, that’s why I went back to try to get better photos, it was still a fail however. Bilbo’s outfit! No wonder you had to go back in! How fun. Did you have nice weather every day? It looks absolutely beautiful in the photos. For some reason I imagine that it is always perfect there. We were lucky with the weather and it was nice warm and didn’t rain while we were there. However, Wellington is known for it’s wind, and we did have a bit of the that. As for New Zealand, it’s not perfect weather all the time. It’s raining today, and it rains often. Rhonda, Even though I don’t walk everywhere it certainly is the best way to see. It lets you take the time required to look up, down, around, and even behind! Great reminder. The old public trust building is incredibly beautiful. I bet it’s even better in person. Yes,I will take the tour if is not raining. Blogging A-Z Participant, looking forward to seeing you in April! 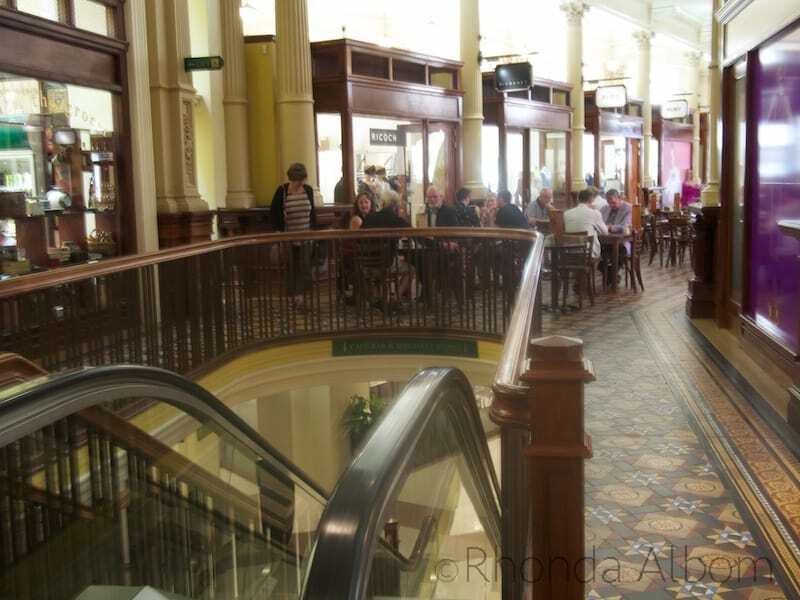 Love the floor of that old bank building, as well as the modern sculptures in your post! Have you been down there, it so cool to see the old ship. It was impossible to photography well enough to share here. I even went back a second time to try again. WE love doing tours! They’re always so interesting. Love that Trust Building. Wellington in an eclectic mix of old and modern. I shared the Public Trust as it’s one of my favorite too. Wonderful photos. I hope to Walk Wellington with you one day. It sure seems like a very Lovely place, nice pictures. What a nice walking tour that must have been. 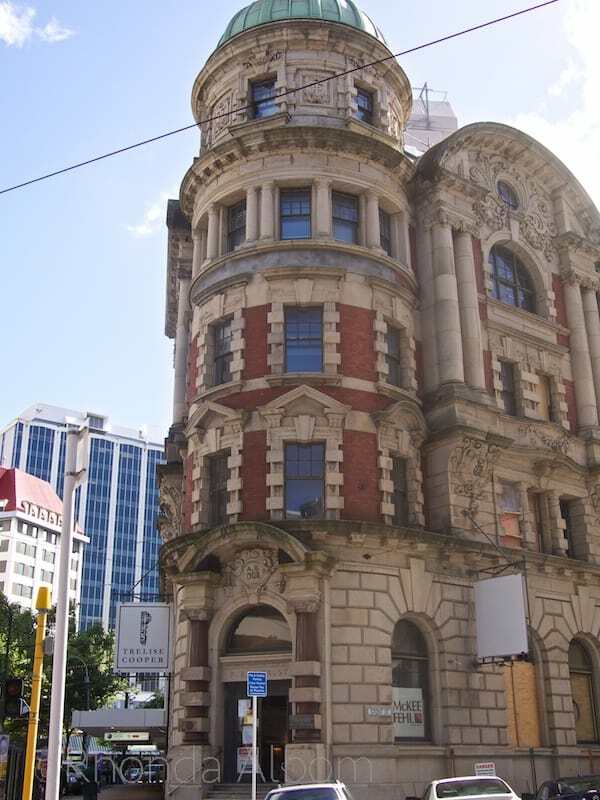 Wellington looks like a beautiful city with interesting architecture. Some amazing architecture. Walking is the best way to see a city. I would love to go on that tour. Sounds like a great time. I love walking tours. I’ve done several in San Francisco and you really do see so much that way. I would imagine a San Francisco walking tour to not cover nearly as much as the city’s interesting features are so spread out. Wellington seems a bit more compact. Of course, San Fransisco is one of my favorite cities. I lived there for nearly 15 years. Very beautiful place. Now, I want to visit. What a wonderful place to capture the architecture, the tower is amazing! The tower, or that fact that New Zealand was worried about Russia attacking in the late 1800s? Of all the places that you featured in your blog this is my fave. The architecture! So stunning and a good mix of different style and time. I want to go there. That sculpture is really neat. Thanks for sharing such great photos on Toronto Teacher Mom! I thought so too Diana. Actually I was surprised by two things, first there is no plaque to explain what it is, and secondly by just how much bigger the South Island is than the North Island.